With air pollution on the rise, our respiratory system is continually abused by a barrage of harmful substances that we breathe in with each inhalation. Fortunately, we are equipped with highly specialised ciliated cells, the multiciliated cells (MCCs), which differentiate hundreds of motile cilia on their apical surface1,2. These cilia beat rhythmically to drive mucus that entraps air borne toxins and pathogens out of the airways – a process called mucociliary clearance in clinical circles. The importance of mucociliary clearance in respiratory physiology is perhaps best exemplified by patients afflicted with diseases, genetic as well as acquired, in which the cilia on MCCs do not function properly. In such instances, individuals suffer from recurrent lung infections that often lead to irreparable damage called bronchiectasis3. Given their importance, it is understandable why the MCCs have lately attracted a lot of attention. MCCs are also present in organs such as the central nervous system (within the brain ventricles and spinal canal), where they promote circulation of cerebrospinal fluid (CSF), and within the reproductive system where they are required for mixing of reproductive fluids and germ cell transportation. Pathological consequences of defective MCCs in these organs include hydrocephalus (distention of the brain ventricles due to improper CSF flow) and infertility, respectively1,2. A particularly intriguing aspect of the MCC differentiation program is the ability of their precursors to support an explosive production of basal bodies (specialised centrioles), which are required to nucleate the assembly of multiple cilia. While most cells duplicate centrioles only once during the cell cycle, how post-mitotic MCC precursors can generate hundreds of these organelles has intrigued cell biologists for decades. However, it is only over the past few years that we have made substantial progress in identifying some of the key genetic determinants and important cell biological pathways that govern the differentiation of the MCCs. Notably, in a seminal piece of work published in 2012, Kinter and colleagues identified a small coiled-coil containing nuclear protein Multicilin (aka Mcidas), related to the celebrated DNA replication factor Geminin, as necessary and sufficient for MCC development4. In their study, which mainly utilized Xenopus embryos that differentiate MCCs on the epidermis, they could show that morpholino-mediated inhibition of Mci function completely abolished MCCs, while its overexpression led to the production of ectopic MCCs at the expense of other epidermal cell-types. Since Mci lacks a DNA binding domain, when a subsequent paper by the same group showed that the protein functions in association with the E2f family of cell-cycle transcription factors to activate MCC-specific gene expression (genes for production of multiple basal bodies and cilia)5, our understanding of MCC development achieved a certain degree of completeness. More importantly, mutations in MCI were concomitantly identified in patients with the respiratory disorder reduced generation of multiple motile cilia, underscoring the importance of the MCC developmental pathway in the etiology of severe airway disease6. It was soon realised though, that there is more to MCCs than Mci. We and others found that another Mci-like protein, Gmnc (aka Gemc1), has identical effects on MCC development. Zebrafish, Xenopus and mice deficient in Gmnc function completely lack MCCs from various tissues in which these cells normally differentiate7,8,9. Moreover, overexpression of Gmnc can drive the production of supernumerary MCCs. In addition, these studies also showed that Gmnc functions upstream of Mci, since Mci is not induced in the absence of Gmnc, but Mci is incapable of inducing Gmnc expression. Despite all of this information, one outstanding question that has lingered in the field is how the activities of two highly related proteins can have near identical effects on the MCC developmental program –both proteins being necessary as well as sufficient for MCC development. We reasoned that evaluating the function of Mci with a stable genetic mutant in the mouse would be the best way forward, as the phenotypes that have been described for the Gmnc mutant mice will allow the appropriate comparisons to be made, in the context of a mammal. Surprisingly, in contrast to the current notion of Mci function, which posits its requirement in MCC specification as well as differentiation, we now report in Development that mice lacking Mci function can generate MCC precursor cells in normal numbers10. These precursors can express the full suite of genes that have been linked to the transcriptional regulation of ciliogenesis. However, they are completely unable to generate any basal bodies for multiciliation, and instead differentiate a single motile-like cilium. A multiciliated cell from the human airway. 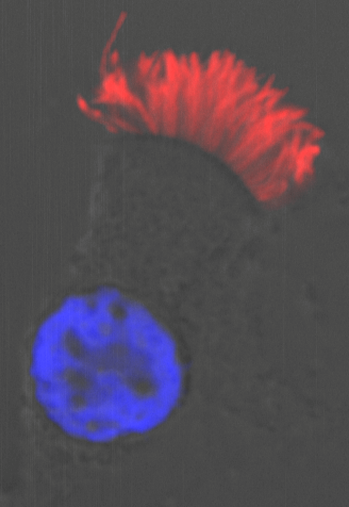 Cilia are stained with antibodies to acetylated tubulin (red) and the nucleus is labelled with DAPI (blue). Moreover, we could show that while Gmnc can activate genes that regulate motile ciliogenesis, Mci preferentially activates genes that promote the biogenesis of multiple basal bodies. Finally, we were also able to demonstrate that the difference in the transcriptional activities of the two proteins possibly lies in the differences in their ability to associate with E2f4 versus E2f5, and thereby target the regulation of different sets of MCC-specific differentiation genes. In sum, our study has clarified that Gmnc functions at the top of the transcriptional hierarchy for making MCCs: it induces MCC precursors and also activates the expression of Mci. Subsequently, Mci programs these cells to generate multiple basal bodies and complete the process of multiciliation10. So what’s next for Mci? While we do need a much better understanding of the molecular basis of Mci-mediated transcriptional regulation, the future looks even brighter for the protein to enable us to tackle a more profound and unsolved issue in MCC development: What is the precise cellular pathway that allows the MCCs to generate multiple basal bodies? Current view posits that there are two ways by which this is achieved. First, in the mother centriole-dependant pathway, the mother centriole is thought to produce a small number of centrioles (this is the pathway utilised for centriole duplication during regular cell cycle). However, it is via a unique MCC-specific alternative pathway, the deuterosome-dependant pathway, that more than 90% of the basal bodies are produced. Although deuterosomes, electron dense ring-shaped structures that function in centriole biogenesis in MCCs, were originally believed to arise de novo, more recent evidence has suggested that they are produced in close association with the daughter centriole11,12,13. Research into the mechanism by which MCCs make multiple basal bodies is in such a state of flux, that accumulating new data are again poised to revise our present view of the contributions the two pathways highlighted above. Three papers, all in preprint, make the tantalising proposition that in fact the centrosomal centrioles are completely dispensable for basal body generation in the MCCs14,15,16! 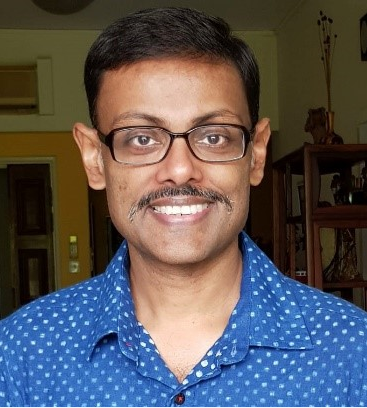 Sudipto Roy is a Senior Principal Investigator with the Institute of Molecular and Cell Biology, A*STAR, Singapore. In the absence of the mother and the daughter centrioles, MCC precursors can generate deuterosomes quite normally, likely from the pericentriolar material (PCM) associated with the microtubule organizing centre (MTOC), and these deuterosomes produce the normal complement of basal bodies. Given that Mci mutant MCCs are totally incapable of generating multiple basal bodies, we can look forward to obtaining useful insights into this enigmatic process through more detailed investigations into the basal body generation defects of the MCC precursors in these mice. In the end, all of this information will add significant value for appreciating the underlying mechanistic basis of the pathological consequences associated with ciliary disorders that affect the formation of the MCCs and the motility of their cilia. BROOKS, ERIC R. & WALLINGFORD, JOHN B. 2014. Multiciliated Cells. Current Biology 24, R973-R982. ZHOU, F. & ROY, S. 2015. SnapShot: Motile Cilia. Cell 162, 224-224.e1. BUSTAMANTE-MARIN, X. M. & OSTROWSKI, L. E. 2017. Cilia and Mucociliary Clearance. Cold Spring Harb. Perspect. Biol. 9, a028241. STUBBS, J. L., VLADAR, E. K., AXELROD, J. D. & KINTNER, C. 2012. Multicilin promotes centriole assembly and ciliogenesis during multiciliate cell differentiation. Cell Biol. 14, 140-7. MA, L., QUIGLEY, I., OMRAN, H. & KINTNER, C. 2014. Multicilin drives centriole biogenesis via E2f proteins. Genes Dev. 28, 1461-71. BOON, M., WALLMEIER, J., MA, L., LOGES, N. T., JASPERS, M., OLBRICH, H., DOUGHERTY, G. W., RAIDT, J., WERNER, C., AMIRAV, I., HEVRONI, A., ABITBUL, R., AVITAL, A., SOFERMAN, R., WESSELS, M., O’CALLAGHAN, C., CHUNG, E. M., RUTMAN, A., HIRST, R. A., MOYA, E., MITCHISON, H. M., VAN DAELE, S., DE BOECK, K., JORISSEN, M., KINTNER, C., CUPPENS, H. & OMRAN, H. 2014. MCIDAS mutations result in a mucociliary clearance disorder with reduced generation of multiple motile cilia. Commun. 5, 4418. ARBI, M., PEFANI, D.-E., KYROUSI, C., LALIOTI, M.-E., KALOGEROPOULOU, A., PAPANASTASIOU, A. D., TARAVIRAS, S. & LYGEROU, Z. 2016. GemC1 controls multiciliogenesis in the airway epithelium. EMBO Rep. 17, 400-13. TERRÉ, B., PIERGIOVANNI, G., SEGURA-BAYONA, S., GIL-GÓMEZ, G., YOUSSEF, S. A., ATTOLINI, C. S.-O., WILSCH-BRÄUNINGER, M., JUNG, C., ROJAS, A. M., MARJANOVIĆ, M., KNOBEL, P. A., PALENZUELA, L., LÓPEZ-ROVIRA, T., FORROW, S., HUTTNER, W. B., VALVERDE, M. A., DE BRUIN, A., COSTANZO, V. & STRACKER, T. H. 2016. GEMC1 is a critical regulator of multiciliated cell differentiation. EMBO J. 35, 942-60. ZHOU, F., NARASIMHAN, V., SHBOUL, M., CHONG, Y. L., REVERSADE, B. & ROY, S. 2015. Gmnc is a master regulator of the multiciliated cell differentiation program. Biol. 25, 3267-73. SOROKIN, S. P. 1968. Reconstructions of centriole formation and ciliogenesis in mammalian lungs. Cell Sci. 3, 207-30. ZHAO, H., ZHU, L., ZHU, Y., CAO, J., LI, S., HUANG, Q., XU, T., HUANG, X., YAN, X. & ZHU, X. 2013. The Cep63 paralogue Deup1 enables massive de novo centriole biogenesis for vertebrate multiciliogenesis. Cell. Biol. 15, 1434-44. AL JORD, A., LEMAITRE, A. I., DELGEHYR, N., FAUCOURT, M., SPASSKY, N. & MEUNIER, A. 2014. Centriole amplification by mother and daughter centrioles differs in multiciliated cells. Nature 516, 104-7. MERCEY, O., AL JORD, A., ROSTAING, P., MAHUZIER, A., FORTOUL, A., BOUDJEMA, A.-R., FAUCOURT, M., SPASSKY, N. & MEUNIER, A. 2018. Dynamics of centriole amplification in centrosome-depleted brain multiciliated progenitors. bioRxiv, 503730. NANJUNDAPPA, R., KONG, D., SHIM, K., STEARNS, T., BRODY, S., LONCAREK, J. & MAHJOUB, M. 2018. Regulation of cilia abundance in multiciliated cells. bioRxiv, 478297. ZHAO, H., CHEN, Q., HUANG, Q., YAN, X. & ZHU, X. 2018. Mother centrioles are dispensable for deuterosome formation and function during basal body amplification. bioRxiv, 373662.